Government often initiates drama on a global scale, but interpersonal feuds will erupt in heated moments. The residents of 10 Downing Street were recently treated to the sight of two civil servants in a knock-down drag-out cat fight. Larry the cat is a permanent resident of 10 Downing, hired to chase away mice and relieve the stress of anyone who manages to pet him. His position survived Brexit and David Cameron’s departure, despite the misapprehension that he belonged to the Cameron family. Larry belongs to no man, but he’ll defend what is his. Fur ripped! Collars torn off! This has been a long time coming for Palmerston and Larry. But who left triumphant? Many concerned citizens are wondering why Dixon didn’t jump into the fray and break these Westminster babies apart, but he claims he was too far away to stop them. As my grandmother would say, nature in the raw is seldom mild. And it is the nature of great politicians to throw their passion into their work. He continued: “I went and broke them up, and as I broke them up I got scratched on the leg. I was wearing long trousers but the claws went through to my skin. He also expressed concern over a cat named Gladstone joining the Treasury department and plans for a Cabinet kitty; these concerns were well-founded, because in December of 2016, Ossie and Evie indeed joined the ranks. There are now five cats keeping control of the building’s mouse problems and tensions are high. The only thing that can be said in the situation’s favor is that it’s almost two years later, and both kitties have lived to fight another day. Just like Britain. 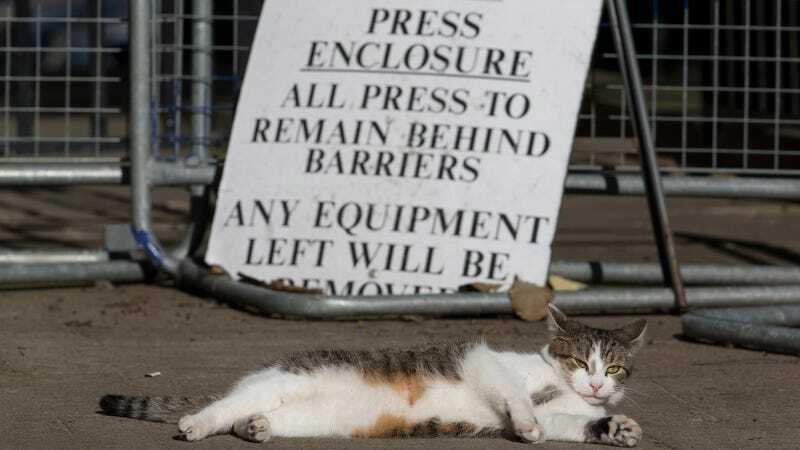 A Question About Brexit: Does 10 Downing Street Get to Keep Larry the Cat?